When the “best laid plans of ‘Ghany Girls go awry..,” well, then ‘Ghany Girls make new plans! 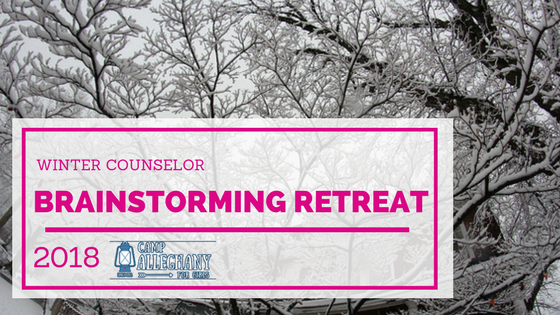 Such was the case earlier this month when we were all excited for our annual Winter Counselor Brainstorming Retreat (WCBR) which was slated for Richmond, Virginia again this year. And just like last year, Old Man Winter decided to barrage us with snow, upending our plans. But, as you read on, you’ll see that, just as in other weather-related situations, ‘Ghany Girls will find a way to get on with the job! This year we invited our Counselor-participants to the WCBR a little differently, based on a kind of motivation-incentive process. What that was was that we planned to include any counselor who applied for #Summer2018 and was hired and had turned in all of her signed paperwork by December 15. This year, that turned out to be 13 counselors, some of whom were from very far away, so the invitation was extended to join us via Skype as well. We scheduled the retreat for the same weekend in January, and actually at the same exact location as last year — at the home of Mary-Curtis Powell, current camp mom and 2nd Term Office Assistant. Thank you so much, Mary-Curtis, for your always gracious offer of warm hospitality and your generosity! Aaaand…. like I said above, just like last year, snow hit Richmond just about the same time as our retreat. Except this year it came a few days before the retreat, and Richmond (as well as several counselors planning to attend) was all snowed in. The Powells’ street wasn’t even plowed by Friday afternoon! So we had to think quickly — ‘Ghany quickly! — and we got all 21st century and turned it into a global-scale Skype-ish meeting (technically we used Zoom, a Skype-like group video format). Seven counselors were able to still join us this way, so we forged ahead with the new plan. Program Director Casey Tucker and I had come up with a variety of topics we were excited to talk about with the counselors, mostly to hear their feedback and get their insight on our ideas. Topics ranged from counselor duties, food allergies/Dining Hall practices, marketing ideas, digital cameras in camp, and much more! To avoid an awkward group video chat where everyone tried to talk at the same time (technology is amazing, but has its limits and its issues), Casey came up with the idea to present a couple of topics at a time to the counselors, then split them up into groups and have everyone hang up from the group call and Skype/FaceTime each other in their small groups to discuss. Then they came back to the main group to share their thoughts. This was brilliant and it worked wonderfully well, inspiring deeper conversations among those smaller groups, and then excellent distilling of information back to the larger group! We were really bummed we couldn’t meet in person, but this was about the best we could do. We shortened the meeting to about 2-2.5 hours, since we werent in person and not having a group lunch break and social session. Instead we had a power-packed but shorter — and very productive — meeting with “virtual camaraderie,” great conversation and super idea sharing. We will continue the WCBR retreat in the future. Whether we stick to this same weekend in January, or the same location (Richmond), we don’t know! We’ve clearly had bad snow luck two years in a row so maybe next time there will be a break, who knows? Whatever we do, we know we’ll rely on our excellent counselors to contribute their creativity, experience, knowledge, and spirit! We loved that the group was returning counselors who will be there to help implement some of our ideas, so we’ll likely stick to the same criteria for joining the retreat — getting that paperwork in! All in all it was a really productive, wonderful conversation, and we hope next year we’ll be back to meeting in person!